I have a food-heavy post for you today. Hope you’re hungry! 1. 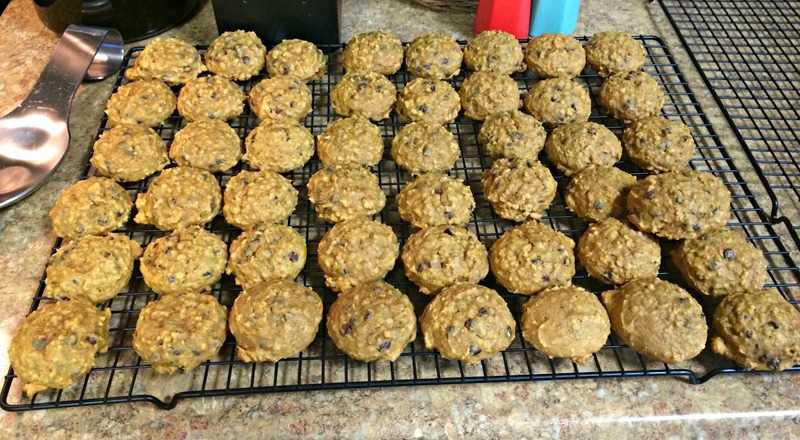 I made a batch of these Pumpkin Oat Chocolate Chip Cookies on Monday. Oh man. They are good! I accidentally grabbed mini chocolate chips instead of regular ones, but it didn’t make that much of a difference in the end. As you can see, the recipe makes plenty to eat, share and freeze for later! 2. I found a new YouTube channel that I’ve really been enjoying! How Jen Does It is a vlog style channel run by the sweetest lady (Jen). 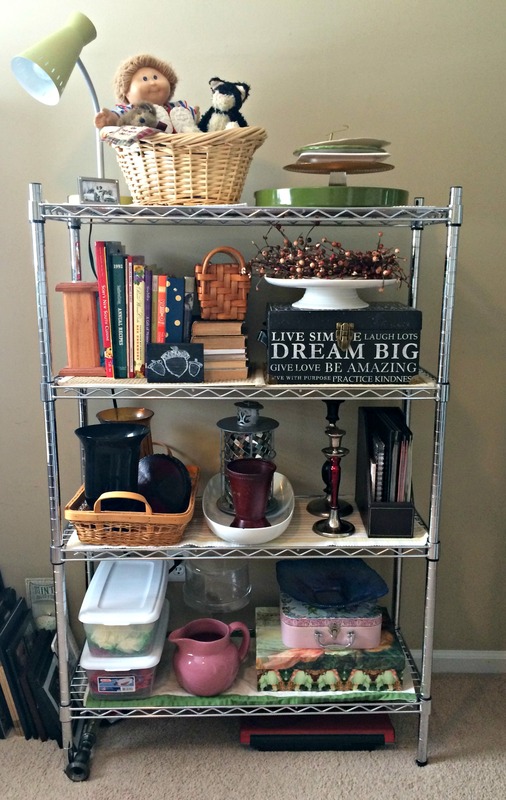 She shares organizing and cleaning tips, recipes, menu planning ideas, grocery hauls, tips for saving time and money, and more. My next High Five was inspired by a side dish I saw Jen make! 3. I saw Jen make this recipe and adapted it to work with what I had on hand. 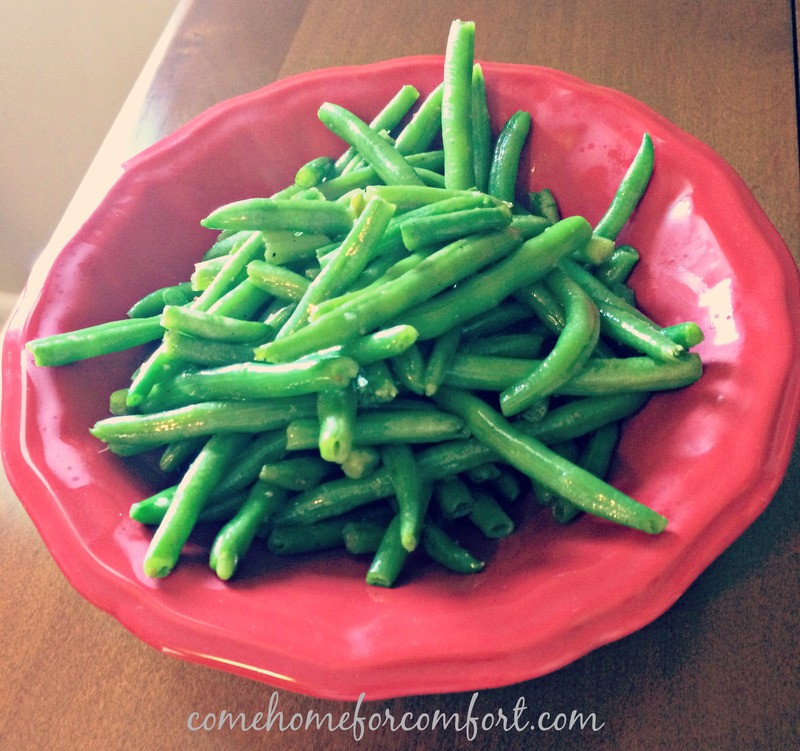 These garlic green beans are SO delicious and a nice change from canned beans cooked “Southern style.” My meat and potatoes husband asked me to make these two nights in a row! Score! 4. 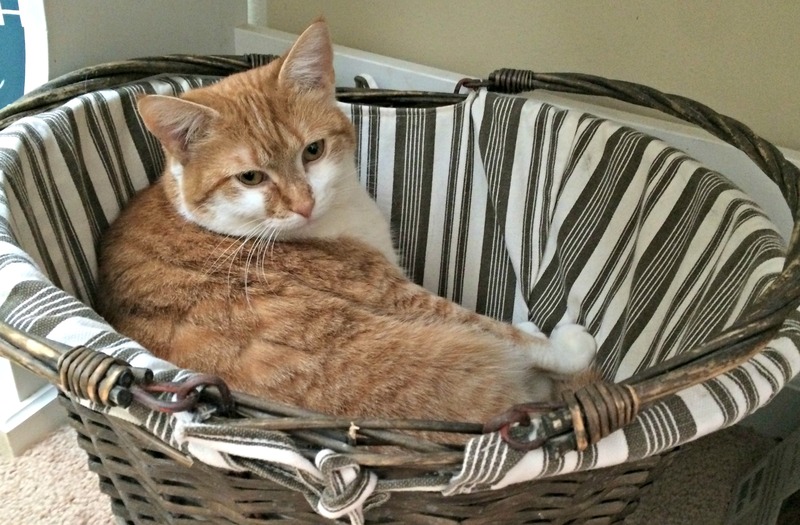 Peggy follows me around the house all day long, and when I’m working in my office she likes to sleep in this basket. She and Thelma Lou used to sleep in the basket together when they were kittens. Not so much any more…but she’s still so cute! 5. Speaking of my office, I’m so happy to finally have it organized! I started working on this room in July and it’s coming along nicely. You know how Southern Living has those amazing rooms full of extra props, dishes and decor for their photo shoots? I have my own “prop” shelf in my office, full of my extra decor pieces that I don’t have out in the rest of the house. I love having everything organized and at my fingertips. Previous Post Do You Use A Guest Book? Garlic is such a good flavor with green beans–I usually make mine in a garlic-y stir-fry style because I was brought up on Asian food, so now boiled or canned beans taste bland to me, haha! This is the first time I’ve used garlic with my beans, but it won’t be the last. I bet stir frying would be yummy too, thanks for sharing! Oh my word!! Love the prop shelves! Love it!!!! Such a great idea. Aww! Maybe I need to get a basket for my office! My cat’s preferred space for sleeping is in my lap…which makes working a LITTLE hard hah! Thanks for sharing the video. I need to watch more to get my home more organized. I spy a Cabbage Patch doll! That was my fav toy of my childhood! Those cookies look delicious!! I like to mix 1/2 mini chips and 1/2 regular chips for cookies. Looking forward to checking out Jen’s videos. Hope you have a great weekend. Ooooh…I like the mixing idea. I’ll definitely try that next time I make these cookies. Thanks! Have a lovely weekend! Jasper! How cute! I love your prop shelves; so pretty! Looks like a productive week! Fun reading all your tips. Thanks for sharing!